It is one of the most widely cultivated tree fruits, and the most widely known of the many members of genus Malus that are used by humans. Apples grow on small, deciduous trees. The tree originated in Western Asia, where its wild ancestor, Malus sieversii, is still found today. Apples have been grown for thousands of years in Asia and Europe, and were brought to North America by European colonists. 1582 If you lived in Italy and many other Catholic countries, this day and the next 10 days did not exist due to the Gregorian Calendar Adjustment (it corrected an accumulated 11 day discrepancy). The day following Thursday, October 4, 1582 was Friday, October 15, 1582. It was effective in most Catholic countries. The old Julian calendar continued in use in Britain and its colonies until 1752, in Japan until 1873, in China until 1912, in Russia until 1918, in Greece until 1923, and in Turkey until 1925. 1902 Ray Kroc is born in Oak Park, Illinois. Ray Kroc sold blenders for milkshakes, and one of his customers was a restaurant in San Bernardino, California owned by Maurice and Richard McDonald. Kroc set up a chain of drive-in restaurants based on their efficient assembly line production kitchen. He opened his first restaurant on April 15, 1955 in Des Plaines, Illinois. By 1961 he had 228 restaurants and he bought out the McDonald brothers. When he died in 1984 there were over 7,500 McDonald’s restaurants. 1948 Brian Connolly of the music group ‘Sweet’ was born. 1983 Earl Silas Tupper died. The inventor of Tupperware. (Tupperware makes the containers used to conduct mold and bacterial experiments in the back of refrigerator shelves). 2007 One week after recalling almost 22 million pounds of ground beef products, Topps Meat Company announced it was going out of business. Topps had to recall the meat after samples tested positive for E. colibacteria, and at least 30 people had become ill since July. Topps was one of the country’s largest manufacturers of frozen hamburgers. I always thought it was Apple Brown Betty. 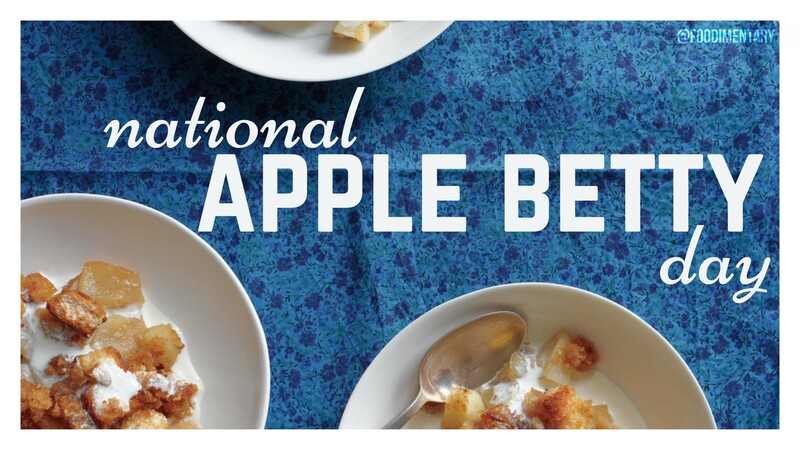 What is an Apple Betty?